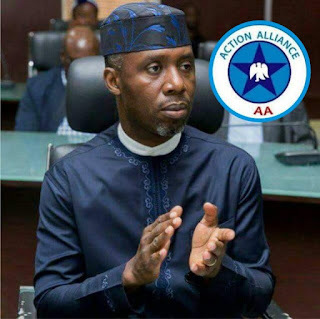 The national Chairman of Action Alliance, Barrister Udeze Kenneth Obidich has cleared the air over the Governorship candidature of Ugwumba Uche Nwosu, who flies the Party's flag in Imo State. According to him; "Ugwumba Uche Nwosu's nomination as the governorship candidate of the Action Alliance met all laws and processes known to the Nigerian Constitution, Electoral Act and the Constitution of our great Party. His candidature on our Party's platform is not in any form of dispute and the Party shall support him to win the governorship election in 2019." Udeze who was elected the national Chairman of the Action Alliance in April 2017 clarified that his position as the national Chairman of the Party is not in dispute and that any other person laying claim to that is an impostor who must not be taken seriously by the public. He explained that Ugwumba Uche Nwosu is like a good tree that bears good fruits, hence, the stones. "We understand that Ugwumba Uche Nwosu has a most formidable support structure across the State which intimidates his opponents so much that they feel that the best way to stop him from winning the election is by making efforts to stop him from being on the ballot." The legal practioner turned politician advised those opposed to Ugwumba Uche Nwosu's governorship ambition to stop acting like defeated weaklings and get more involved with strategies to get the people on their side. "I think there is a limit to blackmail and even propaganda in politics. Our great Party is already mobilizing voters to ensure total victory for us in the coming elections and we will not be distracted by some political contractors seeking attention by all means." He concluded.